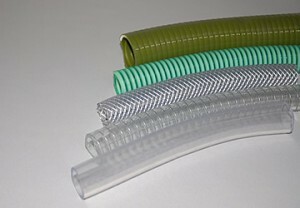 If you’re looking for cost-cutting measures from your hose assemblies, then look no further than a fantastic PVC hose. Typically cheaper than rubber, PVC still offers much in the way of durability and is commonplace across a range of industries. As it’s commonly used to transfer water and air, PVC does not lend itself kindly to chemical distribution but can be often found in food and agricultural industries. However, if the inner lining of a PVC hose is reinforced with more resistive materials then it can offer fantastic support in a range of other applications. PVC stands for Polyvinyl chloride and is a thermoplastic polymer produced by the polymerisation of vinyl chloride, which has replaced rubber in many applications over time. Other than being an advantageous product with regards to cost-effectiveness, PVC contains less petroleum than most other polymers. The process of polymerisation came about after PVC was first discovered in the late 1800’s when the gas Vinyl Chloride was exposed to sunlight and changed to a solid through this process. The hard plastic which was then formed was not used much until the 1920’s, when alternatives to rubber were being researched. PVC hose has become a popular product choice ever since the 1960’s and is also commonly found in agriculture, manufacturing, food & beverage industry, plus everyday household items. There are various types of this variation of industrial hoses including, but not exclusive to lay flat hose, steel wire braided hose, suction hose and rubber lined fire hose. Other than for use in industrial applications, PVC is also used for everyday garden hoses, bathrooms shower hoses and spray attachments on kitchen sinks. All good stockists will be able to discern which hose assembly you require so ensure you contact a respected one to match your needs. All hose assemblies supplied by Buckley Industrial comply with the Pressure Equipment Directive (EC/97/23).